Recent decades have seen dramatic and often unexplained reductions in key fisheries. For example, in South Africa, the Chokka Squid fishery, responsible for delivering £30M annually to the impoverished Eastern Cape region, collapsed in 2011, with devastating effect on fishers and fishing industries. Although the fishery has since recovered, the causes of both the collapse and subsequent recovery are unclear, and there is a fear that the collapse may have been the result of ecosystem shifts, driven by climate change. Understanding the underlying causes of both collapse and recovery is essential for planning adaptation measures that can protect affected communities from the impacts of future variability and change. 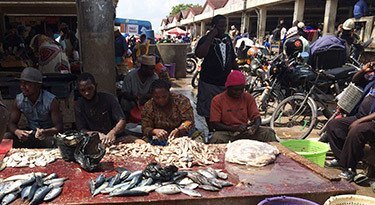 In Tanzania, there is concern that climate change may lead to ecosystem changes that could impact the fishery for ‘small pelagics’. This diverse group includes mackerel, sardines and anchovies – found in schools over the continental shelf, in bays and deep lagoons with nutrient rich waters. 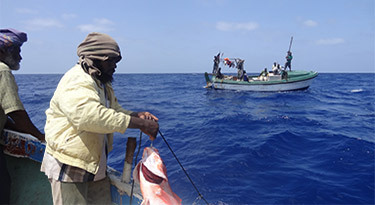 The fishery is important as a source of livelihood support, food security and nutrition, particularly for low-income households, which cannot afford larger, more expensive fish species favoured, for example by tourists. Despite its importance for coastal economies, there is a lack of data and information about the fishery, which hampers effective management. 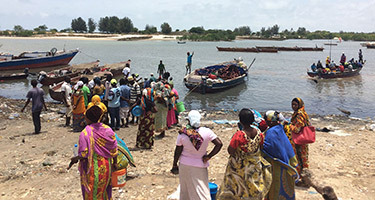 In Kenya, the emerging fishery of the North Kenya Banks is seen as an opportunity for coastal populations. As yet, relavely unexploited, this fishery is expected to spur economic growth for coastal communities. If well managed, the fishery could help achieve national development goals, including poverty alleviation and wealth creation. However, sustainability requires informed management interventions, yet there is only scant information on the ecological status and drivers of the fishery. These are only three examples, chosen as SOLSTICE case studies. Similar issues can be found elsewhere in the region, wherever changes to marine ecosystems affect marine living resources and the communities that depend on them. Managing the impacts of changes to WIO fisheries and the people who depend on them requires a mature capacity to deliver sound and relevant information from environmental and socio-economic research. At present marine science in the WIO have insufficient capacity to collect the key data needed to fully monitor and understand variability and change in the region. As a result policy developers and resource managers lack the support they need to develop science-based options for climate change adaptation and deliver sustainable management of marine resources. Identification of effective pathways and mechanisms for incorporating scientific information into development of management guidelines and policies. (A Science-to-Policy Approach). Fish market in Zanzibar, Tanzania. South African squid fishing vessels. Zanzibar fishing boat setting out at dusk Fishing on the North Kenya Banks. Credit: KMFRI. 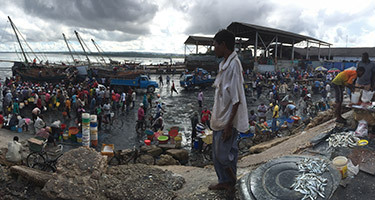 Fish market in Dar es Salaam, Tanzania. Kunduchi fishing village, Tanzania. 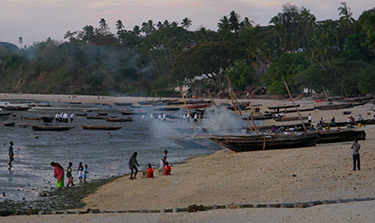 Evening activities in Zanzibar, Tanzania.